Two weeks ago termites swarmed out of my apartment’s termite infested walls (gross and annoying) and decided to make a new home in my furniture. This was disappointing to me for many reasons, not the least of which was that my family has had this furniture for 25 or so years. I grew up with it. Naturally, this termite problem is unacceptable to me. Fact 1: Termites can be killed with 150°F heat. While researching various termite treatments for furniture I learned that termites can be killed with heat. According to eHow, termites die when exposed to 150°F heat for 90 minutes. The good folks at ThermaPure say it is only 130°F. Apparently there used to be large furniture ovens where such heat treatments took place, but most of these businesses have gone under as whole house fumigation has taken over. 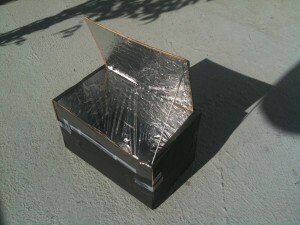 Fact 2: A solar oven can reach 300°F. A few days later a thought occurred to me while I was in the shower. 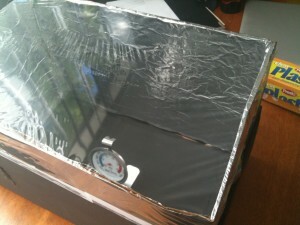 How hot can a solar oven get? It turns out that those simple little cardboard and tinfoil solar ovens that children use to cook hotdogs in science class can reach 300°F. The obvious choice at this point is to build a large solar oven capable of housing my furniture and bake the little bastards. Before building a big oven, however, I built a little oven to test some ideas and get a feel for things. My prototype bug oven is just a cardboard box about the size of two shoe boxes stacked on top of each other. I painted the entire outside of the box and the inside bottom with cheap black paint, and I lined the inside walls and top with tin foil. The top of the box opens to form a reflector. I put a cheap oven thermometer in the bottom to measure the temperature inside, and then I put it in the sun. The oven got hot pretty quickly. I used two different types of plastic to cover the opening. First, I tried the thinnest clear(ish) painters tarp I could find which was .7mil thickness. After 30 minutes in the sun the temperature had reached 160°F. Then I tried some plastic wrap I had in my kitchen. In 30 minutes the temperature reached 190°F. It makes sense that the plastic wrap would work better since the painters tarp was very slightly opaque. So it seems that the solar oven concept is sound, and the things can get pretty hot pretty quickly. From this dry run I learned two things. Plastic wrap works better than a “clear” tarp. In general the clearer the plastic, the better it will work. Duct tape just doesn’t stick to cardboard very well. I used it to construct my oven, but I will try clear packing tape next time. Next up: a bigger version that can accomodate large pieces of furniture. This entry was posted in Projects and tagged cardboard, duct tape, paint, plastic wrap, science, solar oven, termites, tin foil. Bookmark the permalink.